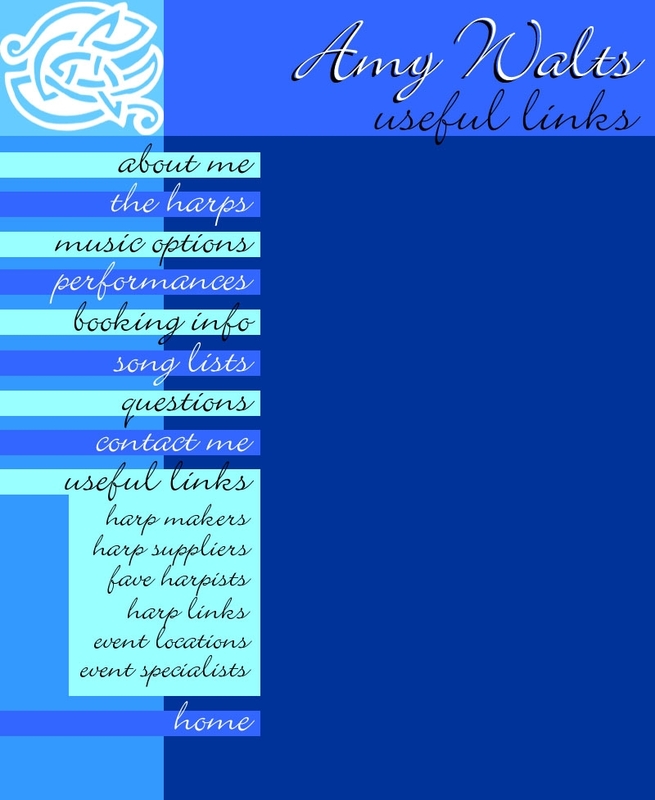 There are a lot of sites on the Internet where you can learn about harps, harpers and all thing harpish (let’s pretend that’s a word). It would be impossible to list them all! But here are a few that I thought you might find useful. Likewise, I am blessed to work with lots and lots of wedding and event professionals; I am always updating and expanding the list. When you come for a consultation, I am always happy to recommend my favorite vendors. A VERY SHORT list appears here; contact me for my latest comprehensive list of favorites. My concert grand pedal (orchestral) harp is a Style 100CG manufactured by Lyon & Healy in Chicago, Illinois. L&H is arguably the finest manufacturer of pedal harps in the world, and each harp is made by amazingly skilled craftsmen right here in the U.S.A.
My Celtic lever harp is an FH36S made by Dusty Strings in Seattle, Washington. 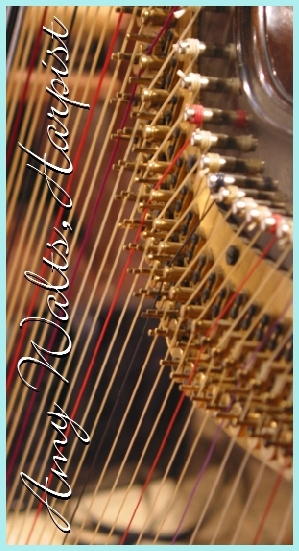 Dusty Strings is, hands down, my favorite manufacturer of lever harps, and my FH36 stole my heart the second I heard it. Another quality American-made harp! 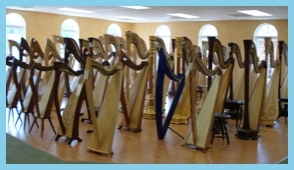 I have bought all my harps in the last ten years from The Virginia Harp Center in Midlothian,Virginia. They’re terrific for customer service and for helping me find exactly the harp I’m after. They also have a second location in Haddonfield, New Jersey. Best harp contacts on the east coast. 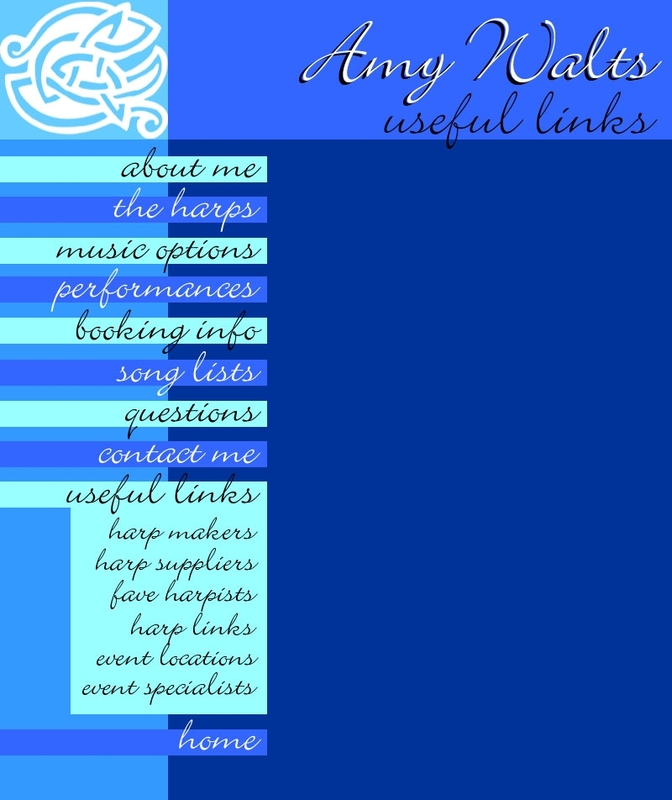 Melody’s is a great source of print music and for lever harps. They have a very nice print catalog of available music. They’re wonderful for folks down south. Another good source of harps and music, this time on the west coast in California. Yes, I am secure and self-confident enough to allow myself to plug the competition, so to speak! These harpists have been wonderful influences on my style. 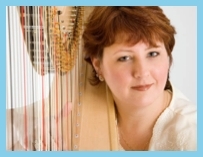 An organization for harpists focusing on the pedal harp. Of limited use to those interested primarily in folk or lever harping. Nationally recognized program training musicians to use music at the bedside in patient care for the ill and dying. An excellent magazine and a must-have if you're a harper/harpist! The In addition to its bi-monthly print edition,Harp Column also has a superior web page and harp resource/info center/bulletin board for harpists and harp enthusiasts. These are just some of the wonderful locations where I regularly perform. being one of the area’s most glamourous and beautiful private venues. 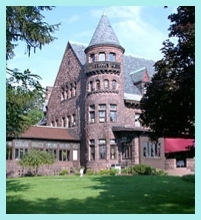 The ultimate in romantic wedding and event settings on the shore of Seneca Lake. Downtown Rochester sophistication for cosmopoltian events. Breathtaking views and classic elegance. 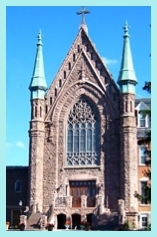 A spectacular neo-Gothic chapel open to all denominations. Brand new ballroom facilities and top-notch accommodations. Remember, this is only a PARTIAL list of my favorites. Special thanks go to the photographers listed for providing some of the beautiful images on this website. Keith is one of my very favorite photographers (and a delightful person to work with!) and some of his work is shown here on my website. He does fabulous portraiture work (understatement). When you’re looking for every moment of that big day to be captured on film, you need Slattery & Crist! Beautiful images, perfect for weddings. Artistry on film. He did the sepiatone picture of me on the left at a wedding. Rick DeLorenzo and his staff are some of the best in the business. Loads of fun and crowdpleasing, but at the same time classy and upscale. Pastor Jack is a fabulous choice for performing ceremonies of all faiths. Friendly, and accommodating, Pastor Jack can come to your home or to many locations. Paul Cassarino and his father Joe not only did my wedding and anniversary rings, but also those of many of my brides. Spectacular! Truly custom work and service. Family-owned and -operated in Rochester for almost 20 years, delicious and customized menus are available for all kinds of events ranging from corporate to wedding to home entertaining. This is an ABBREVIATED list; feel free to contact me for a comprehensive listing of my recommended vendors.